If you are a member of AATG, sign in to AATG Online and register for the exam here. If you don't know your AATG Online username or need other assistance signing in, please contact us via email at nge@aatg.org or call us (M-F 9:00 am to 5:00 pm ET) at 856-795-5553 and staff will be happy to help. Registration for the Level 1 Exams begins February 1, 2019 and runs through March 15, 2019. The late registration period runs from March 16, 2019 to April 19, 2019. A $30 late registration fee applies. Teachers can register their students online for the Exam in three easy steps. Then enter the first and last name, grade level, and exam level for each student taking the Exam. You can also register students by uploading a spreadsheet saved as a .csv file. The first two columns must be labeled "First name" and "Last name". After uploading the .csv file, enter grade level and exam level for each student. Note: If you do not have the option to browse to your spreadsheet after clicking the Browse button, click the lock icon at the top of your browser and then click to allow Flash. Check the information you've entered. To make changes, click "Make changes" at the bottom of the page. To complete your registration, agree to the terms and click "Submit Registration". 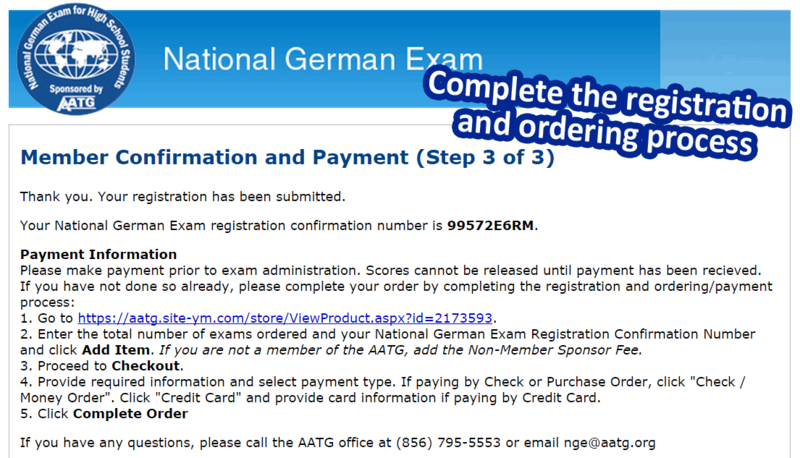 To complete the registration and ordering process, go to the AATG online store to pay or create an invoice. Enter the total number of exams ordered, and your Registration Confirmation Number. If you register between March 16, 2019 and April 19, 2019, click on "Add Item" and add the Late Registration Fee to your cart. Proceed to Checkout. Provide required information and select payment type. Click “Credit Card” or “Check/Money Order” if paying by check or PO. Click “Complete Order” to access a receipt or invoice. You will receive an email with your Level 1 NGE usernames and passwords along with details for Exam administration on March 16 if you register by March 15. If you register after March 15, see the NGE Calendar for the date when you will receive usernames and passwords. To get started with registration, visit www.quia.com/nge1nonmember.